“I want to be harvesting 100 bags of maize and 70 bags of pigeonpea from my farm,” a farmer from Thumbwe EPA in Chiradzulu district, southern Malawi, narrates what he dreams of achieving in his farming enterprise during one of the first Crop-Livestock Integration and Marketing in Malawi (CLIM2) Innovation Platform meetings. And that’s what the visioning program is: Exercising the freedom to dream, and to find ways to make the dream a reality. Traditionally, smallholder farmers’ main (and often, only) aim has been to ensure household food security. The visioning process, a new approach to extension service provision, stimulates farmers to critically think about the present and the future, and helps them achieve it. Through the visioning process, smallholder farmers are able to move from the belief that they should just be growing food grains for the household, to the practice of growing both for household consumption as well as the market. The farmers’ vision will drive them to dream beyond what they have considered the norm, to engage in intensifying the enterprises that will help them realise their dreams. Farmers, through the visioning process, focus on producing outputs that will be better suited for the market and the profitability of the farming enterprises. As the process evolves, there is the potential for other ripple effects: farmers realize that they need to invest in improved inputs, working with extension and support services as well as private sector, in order to transition from subsistence to market-oriented enterprises. They gain the impetus to improve the quality and quantity required for the market; ultimately, this can lead to farmers to gaining higher returns on their investments. Initially, the farmers, accustomed to more practical methods, are skeptical: How can this ‘small talk’ have any tangible results? But they gradually settle in and when they share their visions, the entire platform is astonished to learn about their dreams and carefully laid out strategies. One representative explains how he wants to move from staying in a thatch-roofed house, harvesting low yields from his maize and pigeonpea garden, his children failing to go to school and his chicken flock failing to breed, to living in a house with an iron sheet roofed, harvesting up to 100 bags of maize and 70 bags of pigeonpea, his whole family well-nourished and healthy, his children going to school and raising more chickens and goats in properly constructed kholas (animal houses). All the stories from his current to his desired future were clearly illustrated in drawings and points. Several such visions from other farmers help extension service providers identify the challenges and gaps they can support in order for the farmers to reach their goals. Interestingly, farmers bring forward their own strategies on how to improve their livelihoods. The private sector is not excluded from the fruits of the visioning process. A hotel representative asked the farmer during the same meeting, “You plan to grow and harvest up to 70 bags of pigeonpea, but do you have a market for that?” This led to important discussions on output markets, illustrating the contribution of the visioning process to much-needed coordination among various actors in the agricultural value chains. In most cases, the challenges hindering the farmers’ visions and goals are surmountable. The major challenges identified included poor access to improved crop varieties and improved animal breeds, access to markets and support services, low soil fertility and frequent pests and diseases. What emerged from the visioning process was that investments and interventions aimed at addressing these challenges, and which up until now have been holding farmers back, could actually be leading to significant changes in the lives of many farmers. This is why Innovation Platforms, which start with visioning, are a powerful tool, as they identify and communicate these challenges/barriers with relevant stakeholders, and create an environment where, together, solutions can be found and farmers can find it easier to fulfil their visions. While much work lies ahead for all the stakeholders, the visioning provides farmers, government extension, service providers and private sector with direction, which, in turn, can help farmers as well as service provides plan and work towards improved livelihoods. 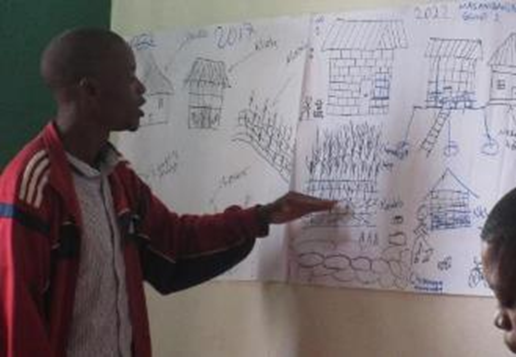 Formulating these strategies motivates farmers to form clubs, participate in training sessions and try new techniques to improve farming and marketing skills. Eventually, this will give farmers a greater sense of ownership, confidence and self- determination, encouraging them to lead their own way forward. Moreover, interaction between farmers, service providers and private sector is a first step towards improving their working relationship.